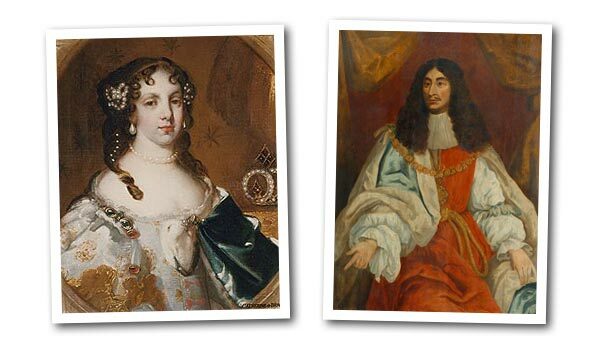 When the marriage plans were under discussion, Charles II was persuaded that the Portuguese princess would make a tolerable wife when he was shown a portrait brought over by the Portuguese ambassador. A Londoner reported on 11th May 1661 the “The picture of out intended Queen is at Whitehall; by that and the report of those that have seen her she is a lovely little woman.” Standing before it Charles is said to have remarked “That person cannot be unhandsome”. His hesitancy was understandable, for the portrait in fact shows a doll like young lady wearing a stiff Portuguese court dress with a huge farthingale. Her hair is brushed horizontally across her forehead, but allowed otherwise to ripple loose to her shoulders, signifying her virginal marriageable state. The original was painted by Dirck Stoop, a Dutchman working at the court in Lisbon. On the wedding day in Lisbon a version of this portrait together with a full length of King Charles, was carried through the streets as part of the public celebration. Apart from the solemn Catholic matrimonial mass in the great Manueline Abbey of St, Jerome at Belem on the river Tagus, there was a stately procession passing under triumphal arches, followed by a bullfight and later an aquatic carnival with fireworks. A colourful record of the proceedings is to be found in a heroic poem called Iter Lusitania: or the Portugal Voyage which celebrated the wedding and the Queen’s journey from Portugal to England. This publication was illustrated with half a dozen engravings by an eyewitness, the same Dirck Stoop, who had a special allegiance to the Infanta and came to England in her retinue in 1662. A royal marriage at this time was merely a political match, although they were expected to produce an heir. 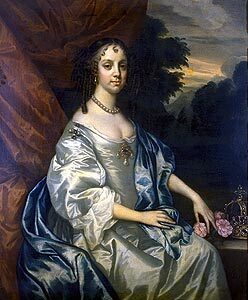 In this she signally failed, but the King remained true to her, in the formal sense of honouring her as his wife, despite her childlessness and throughout the time she was accused of sedition during the succession crisis and the Popish Plot of 1678 – 1681. Very soon after arriving in England the Queen adopted English dress and arranged her hair in fashionable wired bunches of ringlets on either side of her face. It was like this that Samuel Cooper painted her, in an unfinished miniature which is one of the prized possessions of Her Majesty the Queen today. Charles II acquired it for the Royal Collection after the artist’s death. A royal portrait like this, made from the life, from which he might be required to make many copies, would be kept by Cooper in his studio for the purpose of reproduction. The spontaneity of a life sitting is clearly visible. With the fervour of the restoration, demand for paintings of Charles outstripped all expectations. The affable King’s personal popularity was high, and his Queen, despite her Catholicism, basked in reflected glory. They were both painted by Peter Lely, but the head and shoulders of the Queen, which normally hangs in the Officers Mess, is after an original by a Dutchman called Pieter Borsselaer who came to this country in the early 1660s. The larger of the Regiment’s pictures of the Queen, hanging at Regimental Headquarters, Canterbury over the stairs, is a composition usually ascribed to Jacob Huysmans, a Catholic painter from Antwerp. Both show her holding an orb, with a crown nearby. The complimentary inclusion of the regalia, ermine and crimson velvet makes them both formal state portraits, but the fact was, that the Queen was never crowned. Charles had been crowned well before her arrival, in order to avoid the difficulty of crowning a Catholic. Perhaps it was the Queen herself who chose less stately but more subtle types of portrait. Portrayal as a Saint, carrying a martyr’s palm, and kneeling on a broken wheel, reveals that she had dedicated her life to the devotion of her religion. Her childhood had been spent in a remote convent, and upon her marriage she saw her duty in England to be protector of the Catholic faith. It had been one of the conditions of the marriage treaty that she would be allowed to practice her religion in England without interference, and throughout much of Charles II’s reign, her chapels at St. James’s and in Somerset House were the only places in London where Catholics could worship freely. The second very beautiful portrait of the Queen as a shepherdess can be seen today in the King’s dining room at Windsor Castle in an elaborate Grinling Gibbon’s frame. The mood of the painting would appear recreational; the ducks at her feet might reflect her interest in birds – she kept her own aviary, importing parrots and cockatoos from India. She wears silvery white, rose and blue, and a broad – brimmed hat pinned with a butterfly brooch. Her hair hangs long and loose. It was de rigueur at the time to be painted in this ‘timeless’ pastoral gear to avoid being quickly dated by changing fashions. But 17th century paintings often have hidden symbolism. She also holds a crook and her left hand rests on a lamb with a fair-haired boy tipping flowers over its back. The lamb is associated with innocence, gentleness, patience and humility. It is also symbolic of Christ the shepherd, and with his sacrifice for mankind. Catherine had all the foregoing qualities, and she may have identified particularly with the Good Shepherd in her duties as leader of the Catholic faith in England. Why else is the boy showering the lamb with flowers, rather than herself? She is shown seated out of doors, surrounded by birds and animals, in a later portrait painted about 1680 by Benedetto Gennari. This is the painting illustrated by Jock Haswell on p.15 of his book on the regiment: the painting itself hangs at Goodwood. 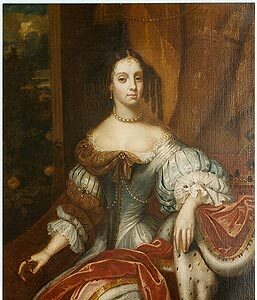 Gennari was another Catholic, an Italian who came to England in the suite of Mary of Modena when she married James, Duke of York, the King’s brother. Further gentle symbolism is intended: nourishment is being given to the lamb of Faith, and the book would be a holy one. The fountain, as a source of water, represented one’s spiritual life and salvation, and was often used as an attribute of the Virgin and the Immaculate Conception – the Queen’s hope of bearing a child was still evident. When Charles II died in 1685, Catherine, as Queen Dowager, had three years of openly practising her religion without fear while the Catholic James II was on the throne. After his exile in 1688, however, under William and Mary, all Catholic chapels were closed, Catherine’s household was drastically reduced, and she was hounded into meaner accommodation. For a number of years she felt it her duty to stay on and represent the Catholic faith in England, but finally the cross that she had born so bravely against the spiteful intolerance of Queen Mary, became too much, and she managed to get leave from Louis XIV to journey across France to her homeland, the only method of travel that she could afford. She died in Portugal after steering her own country, as Queen Regent, through some difficult shoals at the start of the eighteenth century. By then, to English Catholics, she had become something of a martyr. It has been suggested that it was as her special symbol that the Paschal Lamb was adopted by the Regiment at this time. It was about this time that its officers began to be called “Kirke’s Lambs” and the Regiment would not have been averse. The army historian, John Childs, states that before its dissolution, the Tangiers garrison was periodically accused by Parliament of being a hotbed of popery. It would be the hidden Catholic significance of the Lamb combined with the flag of St. George of England that could convey the Regiment’s dual allegiance to Queen and to nation. The lamb is not an emblem of the Royal House of Braganza, which has seven towers in its crest. A tower can just be seen in the background of the painting of ‘Saint’ Catherine by Huysmans. The original of this portrait is now in the hands of a wine-growing family and kept at a Quinta or villa/farmhouse just south of the Tagus. It is a wry post-script to her story to discover that it is this saintly representation which is reproduced on the label of a delicious woody Vinho Branco called “Catarina”. Series of amalgamation is now part of The Princess of Wale’s Royal Regiment (Queen’s and Royal Hampshires). The Queen’s Royal Regiment through a Lady.